This article is about the spice. For other uses, see Paprika (disambiguation). Paprika (US English more commonly /pəˈpriːkə/ ( listen), British English more commonly /ˈpæprɪkə/ ( listen)) is a ground spice made from dried red fruits of the larger and sweeter varieties of the plant Capsicum annuum, called bell pepper or sweet pepper. The most common variety used for making paprika is tomato pepper, sometimes with the addition of more pungent varieties, called chili peppers, and cayenne pepper. In many languages, but not English, the word paprika also refers to the plant and the fruit from which the spice is made. Although paprika is often associated with Hungarian cuisine, the peppers from which it is made are native to the New World and were later introduced to the Old World. Originating in central Mexico, paprika was brought to Spain in the 16th century. The seasoning is also used to add color to many types of dishes. 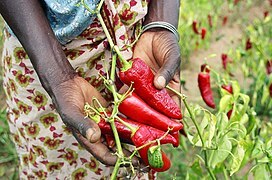 The trade in paprika expanded from the Iberian Peninsula to Africa and Asia,:8 and ultimately reached Central Europe through the Balkans, then under Ottoman rule, which explains the Hungarian origin of the English term. In Spanish, paprika has been known as pimentón since the 16th century, when it became a typical ingredient in the cuisine of western Extremadura. :5, 73 Despite its presence in Central Europe since the beginning of Ottoman conquests, it did not become popular in Hungary until the late 19th century. Paprika can range from mild to hot – the flavor also varies from country to country – but almost all plants grown produce the sweet variety. Sweet paprika is mostly composed of the pericarp, with more than half of the seeds removed, whereas hot paprika contains some seeds, stalks, placentas, and calyces. :5, 73 The red, orange or yellow color of paprika is due to its content of carotenoids. 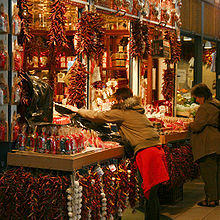 The plant used to make the Hungarian version of the spice was grown in 1569 by the Turks at Buda (now part of Budapest, the capital of Hungary). Central European paprika was hot until the 1920s, when a Szeged breeder found a plant that produced sweet fruit, which he grafted onto other plants. Paprika is produced in various places including Hungary, Serbia, Spain, the Netherlands, China, and some regions of the United States. Spanish paprika (pimentón) is available in three versions — mild (pimentón dulce), mildly spicy (pimentón agridulce) and spicy (pimentón picante). The most common Spanish paprika, Pimentón de la Vera, has a distinct smoky flavor and aroma, as it is dried by smoking, typically using oak wood. 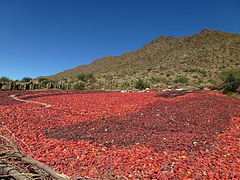 Pimentón de Murcia is not smoked, traditionally being dried in the sun or in kilns. Paprika is used as an ingredient in numerous dishes throughout the world. It is principally used to season and color rices, stews, and soups, such as goulash, and in the preparation of sausages, mixed with meats and other spices. In the United States, paprika is frequently sprinkled raw on foods as a garnish, but the flavor is more effectively brought out by heating it in oil. Hungarian national dishes incorporating paprika include gulyas (goulash), a meat stew, and paprikash (paprika gravy: a Hungarian recipe combining meat or chicken, broth, paprika, and sour cream). In Moroccan cuisine, paprika (tahmira) is usually augmented by the addition of a small amount of olive oil blended into it. The red, orange or yellow color of paprika powder derives from its mix of carotenoids. Yellow-orange paprika colors derive primarily from α-carotene and β-carotene (provitamin A compounds), zeaxanthin, lutein and β-cryptoxanthin, whereas red colors derive from capsanthin and capsorubin. In a typical serving size of one teaspoon (2 grams), paprika supplies 6 calories and is rich in vitamin A (21% of the Daily Value, DV), moderate in vitamin B6 (14% DV) and vitamin E (10% DV), and provides no other nutrients in significant content. ^ "Definition of PAPRIKA". merriam-webster.com. Retrieved April 7, 2017. ^ "paprika - definition of paprika in English - Oxford Dictionaries". oxforddictionaries.com. Retrieved April 7, 2017. ^ "pepper". Retrieved April 7, 2017 – via The Free Dictionary. ^ Dyer, Mary H. "Hungarian Tomato Pepper Plant Information". gardeningknowhow.com. Gardening Know How. Retrieved January 3, 2018. ^ "Ingredients: Paprika". drgourmet.com. Retrieved April 7, 2017. ^ "What is Paprika? (with pictures)". wisegeek.org. Retrieved April 7, 2017. ^ "Paprika". Genius Kitchen. Retrieved January 3, 2018. ^ a b c d Andrews, Jean (1995). Peppers: The Domesticated Capsicums (New ed.). Austin, Texas: University of Texas Press. p. 8. ISBN 9780292704671. Retrieved October 20, 2016. ^ Ayto, John (1990). The Glutton's Glossary: A Dictionary of Food and Drink Terms. London: Routledge. p. 205. ISBN 9780415026475. Retrieved October 20, 2016. ^ a b Sasvari, Joanne (2005). Paprika: A Spicy Memoir from Hungary. Toronto, ON: CanWest Books. p. 202. ISBN 9781897229057. Retrieved October 20, 2016. ^ a b c Gómez-García Mdel, R; Ochoa-Alejo, N (2013). "Biochemistry and molecular biology of carotenoid biosynthesis in chili peppers (Capsicum spp.)". International Journal of Molecular Sciences. 14 (9): 19025–53. doi:10.3390/ijms140919025. PMC 3794819. PMID 24065101. ^ a b c "Online Etymology Dictionary". Etymonline.com. Retrieved November 4, 2011. ^ Lieber, Francis (1831). encuclopaedia americana. p. 476. Retrieved October 20, 2016. ^ A Magyar Nyelv Történeti-Etimológiai Szótára [The Historical-Etymological Dictionary of the Hungarian Language]. 3. Budapest: Akadémiai Kiadó. 1976. p. 93. "paprika 1748 ... Szerb-horvát eredetű ... Ez a szb.-hv. 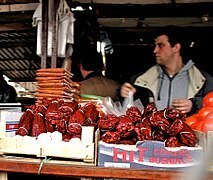 pàpar 'bors' ..." [paprika 1748 ... Serbo-Croatian originally ... This is the Serbo-Croatian pàpar 'pepper' ...] (followed by an explanation of the Hungarian suffix -ka). ^ "Paprika — Food Facts". Food Reference. Retrieved November 4, 2011. ^ a b c NIIR Board of Consultants & Engineers (2006). The Complete Book on Spices & Condiments (With Cultivation, Processing & Uses) (2nd ed.). Asia Pacific Business Press. pp. 133–135. ISBN 8178330385. ^ "Spanish Paprika — Pimentón". Spanishfood.about.com. March 2, 2011. Retrieved November 4, 2011. ^ "Pimentón, or Spanish Paprika: Where It Comes from, How It's Made, and More". The Spruce. Retrieved September 23, 2017. ^ "Nutrient content for paprika in a one teaspoon amount". Conde Nast for the US Department of Agriculture National Nutrient Database, Standard Release 21. 2014. Retrieved October 20, 2016. Wikimedia Commons has media related to Paprika powder.